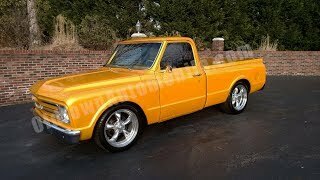 Hi, I am interested in your 1971 Chevrolet C/K Truck (stock #1777) listed on Autotrader for $48,900. I'd like to get more information about this vehicle and confirm its availability. COMPLETE FRAME-OFF RESTORATION, laser-straight, rust-free body, slick Hot Hughes Amber Ecstasy paint, new 68 front sheet metal, smoothed firewall, fiberglass bed cover, all new chrome and trim, new, tinted glass with one piece door glass, Fresh LS1 Fuel injected engine with Comp Cams performance cam package, Edelbrock Victor JR intake, high flow throttle body fuel rails and injectors, Street & Performance headers, Flow master 2.5 exhaust, 4L60E 4 speed automatic transmission with 2500 stall converter, 12 bolt 373 positraction rear, power disc brakes, quick ratio power steering, 2 dropped spindles Eibach lowering springs, Slammer shocks, big front and rear sway bars, 20 American wheels, full custom interior, Flaming River chrome tilt column, Dakota Digital dash, Custom sound system, Painless wiring, Vintage Heat and Air Conditioning, truck needs nothing runs and drives amazing, over $80K INVESTED! Lots of photos and a video on our website at www.oldtownautomobile.com!